Publisher recruitment is one of the more difficult aspects of running an affiliate program in any sector. 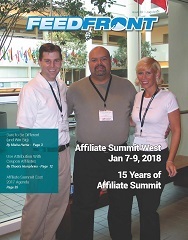 Much has been written to help affiliate managers in this, with helpful tips on the usual methodology, outreach ideas, and ways for engagement. I’d like to expand on my session from Affiliate Management Days with some thoughts on how to ‘think outside the box’ in this to grow your program. The last few years have seen ongoing changes in search, which have affected almost all affiliates. Publishers in many sectors have lost significant traffic volume through Google algorithm changes – this has led many affiliate managers to re-evaluate their programs and re-focus on the kinds of quality publisher sites Google ‘likes’ – those with quality original content. The world of affiliate is evolving, as well, and the former marketing silos are breaking down. So, online publishers may no longer be simply ‘affiliates’, but may also be influencers or bloggers using the affiliate model as just part of their overall revenue stream. Using your keywords to find publishers in search results is a well-worn path and it pays to be intelligent in this. Using search analysis tools to identify your competitors’ strengths can yield valuable insights to identify keyword segments where you’re being outgunned in SERPs (search engine results pages) for specific words and phrases by competitors. Usually, where this is the case, a search marketer would suggest using paid search to cover – however it may well be far more cost-effective to look at affiliate. It will pay to recruit affiliates with strong SERPs on these keywords – incentivise them to focus on those areas, perhaps with enhanced commissions; a much lower cost option than PPC. With any program, there will be a significant number of affiliates who signed to the program and are currently dormant. Examine each in turn to identify those who could potentially be useful and reach out – on a personal level, by phone, if possible, rather than with an obviously standard email template. This can give some quick wins to strengthen your program. If your objective is to find new content affiliates to cover the drop-off in traffic and volumes from coupon and rebate sites, there are plenty of tools and discovery platforms available to help in this. A less certain aspect of some content sites, compared to old-school affiliates who focused on conversion of their outbound links to make a sale, is that for many of these publishers, the objectives surround their audiences and influence. These are not mutually exclusive, of course, but it is a delicate balance to maintain editorial ‘independence’ and to encourage readers to buy, without compromising editorial impartiality. It must be remembered though that 44% of affiliates may only promote one to four brands (Acceleration 2016 Affiliate Marketing Survey), and 68% promote just eight brands. So, even if you have identified the ideal publishers to work with, the hardest part will still come with engaging and activating them in your affiliate program.